A video has been released showing the purported leader of Nigeria's Islamist group Boko Haram dismissing the military's allegations that he is dead. In the video, Abubakar Shekau says his fighters shot down an air force jet that went missing three weeks ago. Last week, the military claimed a man posing as the Boko Haram leader in videos had been killed and in August 2013 said that Shekau may be dead. Security analysts have questioned the credibility of the military's claims. Nigeria journalist Ahmad Salkida, who has good contacts within Boko Haram, said on his Twitter account last week that he had it "on authority that Shekau is well and alive". Is it is not clear when or where the video, obtained by the AFP news agency, was made. But the BBC's Hausa Service editor, Mansur Liman, says the man speaking appears to be the same Abubakar Shekau in other Boko Haram videos. In the video a heavily bearded man stands on the back of a pick-up truck firing an anti-aircraft gun into the air. He mocked the Nigerian military for reporting that he had been killed and was surrounded by heavily armed masked gunmen. The Nigerian military has recorded some recent success against Boko Haram after preventing the town of Konduga, near Maiduguri, the capital of Borno state, from falling into the jihadists' hands. But towns and villages are still under the militants' control and reports that Abubakar Shekau is still alive will once again make it hard for people to believe the information coming from the Nigerian military. Previous assertions about Shekau's demise have been followed a few weeks later by such video message denials. Thousands of people have died during Boko Haram's five-year insurgency - and three states in the north-east have been under a state of emergency for more than a year. The militant group has changed tactics in recent months, holding on to towns in the north-east, where most people are Muslims, rather than carrying out hit-and-run attacks. 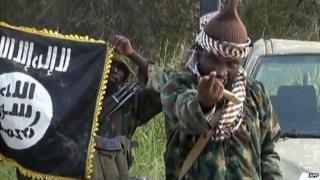 In August, Boko Haram declared an Islamic state in areas it controls - which Shekau refers to in the 36-minute video. "Here I am, alive. I will only die the day Allah takes my breath," he says, mocking the military's "propaganda". "We are running our caliphate, our Islamic caliphate. We follow the Koran... We now practise the injunctions of the Koran in the land of Allah," he says, referring to Sharia punishments. The video contains images of extreme violence, including graphic scenes of an amputation, a stoning to death and a beheading. It also shows the wreckage of a jet that went missing in the north-east on 12 September. Meanwhile, a court martial has begun of Nigerian of 97 soldiers, including 16 officers, who are alleged to have refused orders to fight against the insurgents. It comes two weeks after 12 soldiers were sentenced to death for mutiny, after shots were fired at their commanding officer in the north-eastern city of Maiduguri in May. "Boko Haram" means "Western education is forbidden" in Arabic, and the group frequently attacks schools and colleges, which it sees as a symbol of Western culture. Their abduction of more than 200 schoolgirls from a boarding school in April sparked global outrage.